four × two = Required Please enter the correct value. Futures for the Dow Jones Industrial Average (Thursday) forecast a two-point gain as Asian markets tilted higher after the U.S. Federal Reserve kept interest rates unchanged. Yesterday, the Dow Jones Industrial Average fell more than 222 points after the Fed released a worrisome statement about the global economy and maintained interest rates at current levels. The Fed acknowledged that the global economy cooled in the wake of its December meeting and said it is "closely monitoring" ongoing economic developments before it decides to take further action on monetary policy and interest rates. 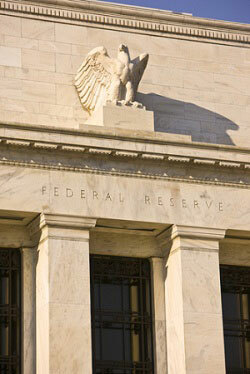 Here's what today's Federal Reserve meeting means for investors in the months ahead. The Stock Market Today: Traders will watch weekly jobless claims and an update on durable goods. In addition, the Bloomberg Consumer Comfort Index and the Pending Sales Index will be in focus. Rebound in Sight: Traders will watch to see if two major S&P 500 components can bounce back after yesterday's dismal trading session. On Wednesday, shares of Apple Inc. (Nasdaq: AAPL) fell more than 6.5% after the company issued a weak iPhone sales outlook, while shares of Boeing Co. (NYSE: BA) fell nearly 9%, its worst one-day performance since August 2011. Following Apple's first-quarter earnings report, investors may be asking if they should purchase FB stock. You can find the answer here. Oil Outlook: Oil prices were ticking up this morning as traders remain hopeful that Russia can strike a deal with members of OPEC to address the growing glut in crude supply by curbing some portion of production. WTI prices added 0.3% to reach $32.42 per barrel. Meanwhile, Brent oil crude – priced in London – gained 0.8% to reach $33.38. The news of Russia's possible cooperation offset supply concerns after the U.S. Energy Information Administration (EIA) announced yesterday that U.S. crude inventories increased by 8.4 million barrels last week. Earnings Report No. 1, F: Before the bell, Ford Motor Co. (NYSE: F) will report fiscal second-quarter earnings. Consensus expectations among analysts call for the automotive giant to report an EPS of $0.49 on top of $35.8 billion in revenue. Earnings Report No. 2, V: Shares of Visa Inc. (NYSE: V) will be in focus this afternoon when the credit card firm reports first-quarter earnings after the bell. Wall Street analysts project that Visa will report per-share earnings of $0.68 on top of $3.4 billion in revenue. Additional companies reporting quarterly earnings include Amazon.com Inc. (Nasdaq: AMZN), Microsoft Corp. (Nasdaq: MSFT), Under Armour Inc. (NYSE: UA), Caterpillar Inc. (NYSE: CAT), and Alibaba Group Holding Ltd. (NYSE: BABA). Stocks to Watch No. 1, FB: Shares of Facebook Inc. (Nasdaq: FB) surged nearly 12% in pre-market hours after the social media giant shattered fourth-quarter earnings expectations. The firm reported an EPS of $0.79 on revenue of $5.84 billion. This is the first time that Facebook topped $5 billion in revenue, and the figure represents a 52% increase compared to last year. The firm cited strong mobile ad revenue for its surge. Stocks to Watch No. 2, SBGI: Shares of Sinclair Broadcast Group Inc. (Nasdaq: SBGI) are moving this morning on news that the local TV station operator will purchase the Tennis Channel for $350 million. The move is seen as an aggressive decision by the firm to boost its cable sports offerings and could be one of many deals this year in the broadcast television sector. Stocks to Watch No. 3, PYPL: Shares of Paypal Holdings Inc. (Nasdaq: PYPL) are up more than 4.5% this morning on news that the company added 6.6 million new customers during the fourth quarter and reported strong quarterly earnings. This was the second earnings report since the payment processor split from eBay Inc. (Nasdaq: EBAY). There's a typo the in the Rebound in Sight section you may wanna change it from 20111 to 2011. Fixed. Thanks for the heads up. And thanks for reading Money Morning.